Yesterday I finished reading the Tunberg and Minkova manuscript. As I told you when I was half the way, the manuscript is sound and as all the works of Tunberg (and Minkova), this one too is a good piece of work which will render excellent services at school. I only had to correct some minor mistakes, errors and misprintings, especially in the paraphrases. I have also done some suggestions to improve the text, now and then in order to bring some variety in the Latin. I would suggest the authors to have a look at the many places where they used 'quoque', which, as far as I can judge, is often used a bit awkwardly. The second version, then, which offers but slight changes (word order, small additions) in comparison with the original Livian text, required a fair number of notes. Therefore I asked myself if it was really worth while to offer three 'Livian' texts, and if it would not be possible to present only the easy paraphrases and the original text (this would require only a few additional notes, I guess): but I confess that I am not familiar with the class practice in America, and that Terence and Milena know it better and thus precisely realize how they can introduce Livy in the best way. Finally, the extracts from book six seemed rather technical to me and I wonder if I myself would have selected these. But here again, I trust that there is a tradition and that the authors considered the historical importance of the contents of that book; moreover I do not know at what age American pupils usually read Livy; if he is read by youngsters aged 17, these texts will do. I am convinced that the book, which actually ties in with long forgotten traditions of teaching Latin authors, will find its way to the schools. It involved more thinking about Livy's Latin and the meaning of the texts - the notes are excellent and really to the point-, and thus more work than one would think at first sight. Please congratulate the authors on my behalf. I believe that the overall format of Milena's and Terry's proposed text is well conceived, and that in their own introduction/preface they articulate well their rationale. I like very much their practice of writing a Latin periphrasis for the earlier selections as a way of "initiating" students into reading Livy's Latin--which is difficult, but (as Milena and Terry put it) very much operae pretium. I believe that, as written, the periphrases should achieve their intended purpose. I also like Milena's and Terry's practice of slightly adapting Livy's text in the beginning, but gradually phasing out both the periphrases and the adaptations of Livy's text. Although perhaps one could argue for continuing the periphrases for a couple of more of the selections, I don't see that as an absolute necessity or as being any serious defect in the overall plan of this text. In short, it is the sort of text that I myself would be happy to use with my undergraduate students, and I certainly encourage Bolchazy-Carducci to continue with the plan to publish it. 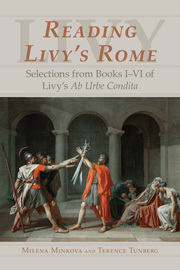 It so happens that I am teaching this coming fall a course which will include Livy as part of the readings. If your timetable is to get Milena's & Terry's text onto the market in time for use in the fall, I would be glad to order it for my class. However, if it is unlikely to be available in time for fall classes (for which, as you know, orders are normally sent in by early summer at the latest), I would be very interested in seeking permission to "test market" this text with my class, even in its "draft" form. If so, I would, of course, be willing to write up my reactions, and those of my students, at the end of the semester.